Was Ronald Reagan, intrepid wager of wars hot and cold, a secret peacenik? Young scholar Lettow argues in the affirmative. 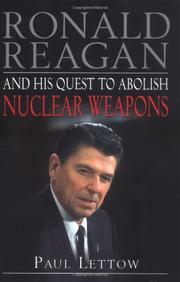 Much as he presumed that tax cuts for the wealthy would stimulate the lower levels of the economy, Reagan apparently believed that his government could launch a massive arms buildup and thereby “attain deep cuts in nuclear weapons”; the trick was simply to outspend the Soviets until they quit. Historians and economists will argue over the relative merits of both approaches, but Lettow traces Reagan’s willingness to take such daring moves to his longstanding dislike of nuclear weapons and of those who encouraged such follies as Mutually Assured Destruction and preemptive first strikes: Robert McNamara, for instance, whom Reagan “publicly derided as ‘that efficient disaster,’ ” and even Henry Kissinger, who encouraged détente rather than reheated competition between the American and Soviet systems. Reagan, writes Lettow, had been active in antinuclear politics in his liberal Hollywood period, and he held to his commitment to abolish nuclear weapons even after his swing to the right. Reagan’s antinuclearism now took curious though internally consistent forms, the outgrowth of his view that only if the US had more nuclear weapons than anyone else—and, later, the protective Strategic Defense Initiative (SDI) “Star Wars” shield—could nuclear war ever be averted. His views courted controversy: many ordinary citizens, of course, failed to see the merit of a new and improved arms race in the 1980s, while Reagan’s own Joint Chiefs of Staff pointedly failed to endorse Reagan’s vaunted MX missile initiative. Yet Reagan and his circle were convinced (as, it seems, is Lettow) that the Kremlin’s fears about SDI “were a principal factor driving the Soviets’ increased willingness to negotiate deep cuts in offensive nuclear forces”—though Mikhail Gorbachev’s rise to power may have had something to do with the change, too. Reagan emerges in strong and flattering light here, one of several scholarly books to take a favorably revisionist view of his presidency in recent history. Reagan admirers will likely concur, though critics may wonder why his long-harbored plans were never really put in motion.